Okay, normally I’m not a huge fan of the pin-up instead of webcomic entry. But Vig really crushed the art on this thing. I mean, look at it! I especially enjoy the Pizza Millennium Falcon or I guess, The Millennium Pizza? Plus the Pac Man Death Star? That alone is a t-shirt. 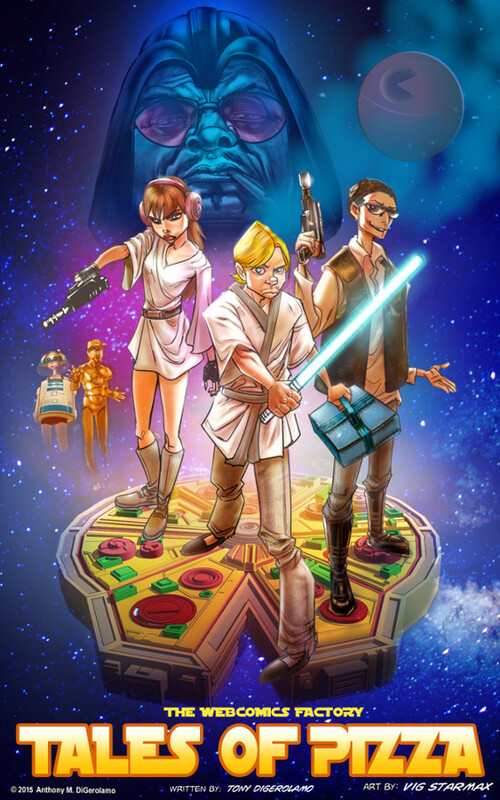 For those of you new to the strip, that’s Mitch the pizza guy as Luke, Spicer the rival pizza guy as Han, Conchita the cashier as Leia, Aaron (the stupidest man in the world) as C3PO, Bailey (his equally dumbass girlfriend) as R2D2 and Reynaldo (the boss) as Darth Vader. I think the Pac Man Death Star represents every Pac Man machine that’s inside a pizza parlor. Vig, by the way, got to see the new Star Wars movie on Wednesday because it showed early in Malaysia. He basically said it’s good, but there’s a lot of rehash of the first three movies. I’m sure I’ll be complaining about it on the Super Frat blog at some point. Anyhow, thanks for checking out the pin up!